This beautiful ankle bracelet is perfect for summer. Made of sterling silver and with gold plated over sterling silver feathers, it looks so pretty on the ankle. Please be advised that all items are sent by Royal Mail first class so delivery dates cannot be guaranteed. 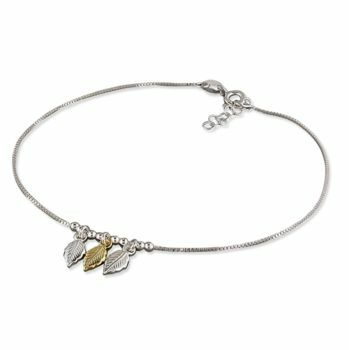 sterling silver ankle bracelet with sterling silver feathers and gold plated over sterling silver feather. The anklet is adjustable and can be worn at 23 - 25cm. This product is dispatched to you by By Poppy.